This story is part of a SPACE.com series to mark a decade of space tourism. Coming Tuesday: A SPACE.com reporter looks at what it feels like to launch in a rocketship; Also, who are the first space tourists? Orbital space tourism is a niche industry at the moment, but business could really boom if costs come down by a couple of orders of magnitude, a new study asserts. 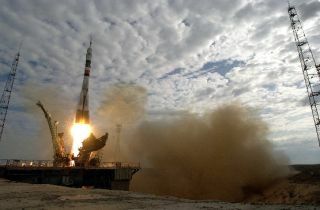 To date, only seven people -- beginning with multimillionaire businessman Dennis Tito in April 2001-- have paid to launch into Earth orbit, and they've reportedly plunked down between $20 million and $35 million for the experience. Those are not the numbers of a thriving industry. But things could change dramatically if prices drop significantly -- down to about $500,000 per seat or so. That reduced rate could lure in hundreds of thousands of customers for orbital tourist trips, potentially generating revenues in excess of $100 billion per year, according to the study. "This is the first time in the theoretical realm that we are at a closed business case," said study lead author Ajay Kothari, president and CEO of the aerospace engineering firm Astrox Corporation. "So that, to me, is very exciting." The current going rate for a two-week tourist trip to space -- including a stay at the International Space Station -- is more than $30 million. The Virginia-based company Space Adventures sells seats for such flights aboard Russian Soyuz vehicles, and right now they're the only game in town. They started out by looking at a landmark 2002 space tourism study put out by the technology consulting firm Futron, with help from the polling company Zogby. This report used interviews with 450 American millionaires to make an assessment of the market for space tourism, both in the orbital and suborbital realms. Though the Futron/Zogby report is nearly a decade old, it remains the most in-depth look at space tourism's potential customer base, Kothari said. The report found, among other things, that 30 percent of the polled millionaires would be willing to spend $1 million for a two-week orbital trip, though only 7 percent would go if the price was set at $20 million per seat. Kothari and his team used the Futron-Zogby results -- as well as data from studies of the numbers and purchasing habits of wealthy people -- as a starting point. Then they performed their own in-depth analysis of the potential global tourist market for orbital spaceflight. The researchers took into account a variety of factors, including eagerness to go to space and physical fitness. For example, the average age of American millionaires is 57 -- so a substantial proportion of willing customers is likely to be too old or infirm to safely withstand the rigors of spaceflight. The team then computed a conservative case, which assumed that passengers would be willing to spend just 1.5 percent of their net worth on an orbital voyage. And they calculated a more optimistic scenario, which assumed a 5 percent net worth threshold. After crunching the numbers, Kothari and his team determined that the worldwide customer base at $5 million per seat is only about 600 people at the 1.5 percent threshold, and about 1,500 folks in the 5 percent scenario. So even if prices drop by a factor of four, that's not good enough to "close the business case" for orbital tourism. If the price comes down to $1 million, the pool is about 9,000 people at the 1.5 percent threshold and 23,000 at 5 percent. That's better -- but still not good enough to support a thriving industry, Kothari said. But that changes if tickets go for $500,000. At that price, the global customer base is 14,000 in the conservative case, but nearly 225,000 in the optimistic scenario. With hundreds of thousands of people willing to fly, revenues could top $100 billion per year within a few decades, according to the study. "A closed business case is definitely possible," Kothari said. He presented the results in San Francisco earlier this month, at the 17th International Space Planes and Hypersonic Systems and Technologies conference, which was organized by the American Institute of Aeronautics and Astronautics. It's a steep drop from over $30 million per seat to $500,000, but Kothari and his team have some ideas about how spaceflight companies could get there. The key is having the right spaceship. The concept vehicle would have a payload capacity of 20,000 pounds (9,091 kilograms) and could carry 40 passengers. It would launch vertically, with a rocket booster doing the heavy lifting for the first part of the journey. At an altitude around 75,000 feet (22,860 meters), the booster would separate and glide back home to the launch pad. At that point, advanced engines on the upper stage -- the actual spaceship -- would kick in. These engines would be dual-function, employing ramjet/scramjet technology -- which uses vehicle speed to compress outside air before combusting it -- until about 100,000 feet (30,480 m) and Mach 10 (10 times the speed of sound). Then the engines would switch over to a rocket function, which would carry the craft the rest of the way into orbit. After completing its space mission, the vehicle would land on a runway, like an airplane or NASA's space shuttle would. While development costs for such a new spacecraft would be high, the vehicle's owners would recoup their money over time by flying it often, according to the study. This fully reusable architecture could eventually lead to launch prices as low as $340 per pound (compared to current figures of $5,000 to $10,000 per pound), Kothari said. And that could well translate to ticket prices lower than $500,000. This spaceship is just a concept vehicle for now, and more work needs to be done before it can become a reality. For one thing, scramjet technology needs to be further developed and tested, according to Kothari. "The scramjet is the cake, and everything else is the icing," Kothari told SPACE.com. "If you don't have the scramjet, you cannot get there." Still, such a spaceship is eminently possible, and it could be operational within a few decades — provided it receives enough funding, Kothari added. "This needs to be developed," he said. "It really should become a program." Of course, many other orbital vehicles are further along in development than the spaceship Kothari envisions. Multiple companies are devising their own crewed craft, with considerable funding help from NASA. Just last week, for example, the space agency doled out nearly $270 million to four companies — Blue Origin, Boeing, Sierra Nevada Corp. and Space Exploration Technologies (SpaceX) — for this very purpose. NASA wants private industry to start carrying cargo and crew to space as soon as possible, in the wake of the space shuttle program's retirement later this year. So orbital space tourists may not be limited to the Soyuz for much longer. "There are going to be other vehicles coming down the line," said Tom Shelley, president of Space Adventures. "And I think pretty much all of those vehicles have private spaceflight as part of their business plan, if you like. It's part of what closes the business case." Space Adventures, for its part, has signed a contract with Boeing to fly people to orbital space on its CST-100 vehicle. And those trips could start relatively soon. "We hope, come 2015, we'll be able to start flying some paying passengers" on the CST-100, Shelley told SPACE.com. This new race to orbital space could help drive costs down substantially, through competition and the development of new, more efficient techologies. But only time will tell if prices drop -- and if so, how much and how fast. Still, all signs point toward the dawn of a new era in human spaceflight, experts say. NASA's effort to encourage private companies to develop their capabilities could open the heavens to more and more folks who don't have $30 million lying around. "This really is what I would call an inflection point for human spaceflight," said Bretton Alexander, president of the Commercial Spaceflight Federation. "This change in human spaceflight will not only regain leadership [for the United States], it will take us light-years ahead of everybody else."